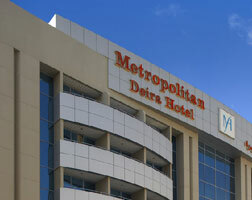 There are two hotels called Metropolitan in Dubai. The other one is being demolished whilst only this one has Dubai’s oldest and best-known Irish pub. The Dubai Mall is the world’s largest, its 1200 shops, cinemas and other attractions cover more space than any other mall. If you visit the Dubai Museum at al-Fahidi Fort, you’ll find that the modern extension has actually been built underneath that historic building. Ingenious. With jets of water that shoot some 150 metres into the night air and over 4000 lights, the Dubai Fountain puts on quite a show. It is, in fact, the world’s largest dancing fountain. Camel races make a change from the usual thoroughbreds (though you can see them too). The ‘ships of the desert’ race on Thursday and Friday in the winter.